The Spectro Oil Service Station will be open and changing oil at the Smoke Out Rally 14 on Friday and Saturday on June 21-22, 2013 in Rockingham, North Carolina. Overseeing the service work will be Eddie Ellis, Owner of Easy Eddies. Check the SmokeOutRally.com for updates. The Smoke Out Rally is a two day Chopper party that celebrates the machine and the men and women that build them. From professional builders to those backyard fabricators and their chops of American, British and Japanese decent are honored. Easy Eddies supplies the full line of Spectro Oil products for stock bikes, cruisers, metric engines, Shovelheads, Evos, custom bikes and for all the varieties of choppers. 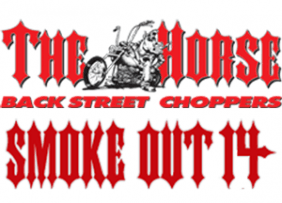 “Spectro Oil is an institution at the Smoke Out Rally and we are excited to have them at our 14th anniversary taking care of the chops and providing their premium oil through Easy Eddies,” said Greg “Edge” Scheuer, the Smoke Out Rally Grand Poobah. The event is a full weekend to look at fine chops, listen to good music, relax, catch up with old friends or make new friends, eat good food, take a couple nice putts in a pretty countryside, drink some beer and shop the vendors wares. Spectro is committed to providing their customers with the best possible products to make their power-sports activities work better. Since 1966, Spectro brands are manufactured and marketed by Intercontinental Lubricants Corp. of Brookfield, CT, ILC, one of the world’s foremost manufacturers and packagers of quality lubricants. All components used in their products are made in USA. For more information on Spectro Oils, please visit www.spectro-oils.com.